An Italian pasta that consists of a variety of tiny shapes. Each shape generally has its own name but they can all be used for one another. 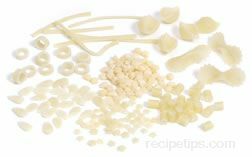 These tiny pasta shapes are used in broth-based soups. Also spelled pastina.